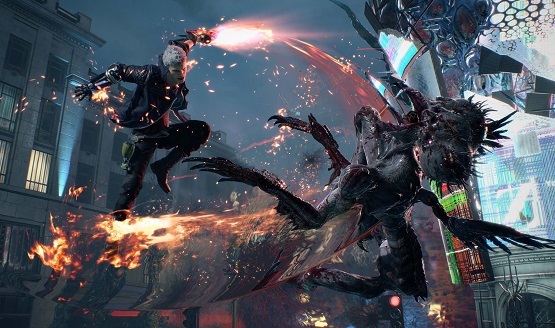 Devil May Cry 5 director Hideaki Itsuno has apparently pulled a Devil Trigger on a new project. Itsuno posted on Twitter that he had a joint cherry blossom viewing with both the DMC5 team and “the new project team.” This comes after successfully continuing the beloved Devil May Cry series with Devil May Cry 5, a game made using the RE Engine that had excellent production values and received acclaim from both reviewers and fans. The one that we need to get resolution on is Rival Schools because in Japan there are three years of high-school. We have seen the first two years for these kids, so the third one would be their last year in high-school. Wouldn’t that be cool? You end it on their graduation ceremony. Rival Schools characters made an appearance in Street Fighter V, appearing in the Kanzuku Beach stage as cameos. This did hint at a future game. Itsuno also liked the idea of bringing back old franchises, bringing up Capcom vs SNK, Street Fighter Alpha, and Power Stone in past interviews. He might even be thinking about taking on the sixth installment of Capcom’s most iconic series, Street Fighter. It has been a while since the last true Capcom fighting game, which was Marvel vs Capcom: Infinite in 2017. Even then, it received mediocre review scores and fans didn’t care much for it. It didn’t even make an appearance at the prominent fighting game tournament Evo. What do you want to see Itsuno work on next? Let us know!